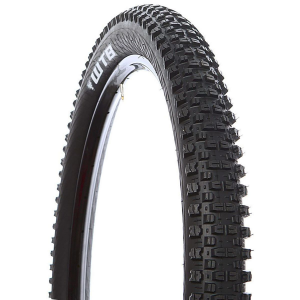 You're not riding with training wheels anymore (we assume), so ditch your slow, cautious, smooth-as-a-baby's-bottom tires for the gnarly, nobbly burliness of the WTB Breakout TCS 27. 5in Tire. The Breakout is large-and-in-charge 2. 5in width and oversized edge knobs keep you gripping like a maniac when you lean into turns, but the fast-rolling belts of center tread help you keep up a good clip when you're climbing or hammering down rolling trails. This particular Breakout comes in two versions, the FR (fast rolling) and HG (high grip). Both use WTB's extra-tough Enduro casing for durability, but the FR checks in at 43g lighter by substituting a lighter, faster Dual DNA rubber for the HG's burlier Gravity DNA compound. If you're riding more XC and trail, the Dual DNA is what you want, but the Gravity DNA is ideal for the more enduro-inclined among us.